I’m pretty sure the transitional phrase “Speaking of Swamp Thing” is implied in most of my posts. Very nice. 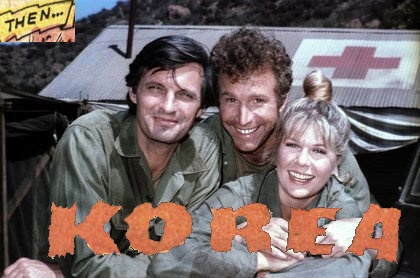 …But then it got me to thinking that, sooner or later, someone’s gonna attempt a M*A*S*H “reboot” and what a bad idea that would be. I’m depending on you young folks to keep that from happening should someone attempt it after I’m gone. 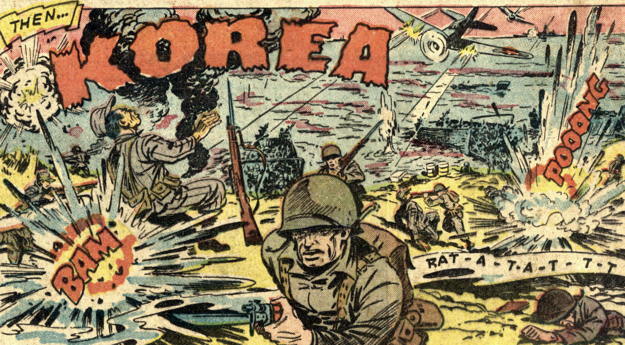 Also, Rich Handley, fan of both apes and swamps, sent along a link to his own Swamp Thing-ified version of the “Then…KOREA” transition, which you can see by clicking on this little ol’ link here. Speaking of Swamp Thing, over here in this John Byrne Forum message thread someone posted a commissioned sketch Byrne did of Swampy ‘n’ Abby. Also in that thread, Byrne relates a couple of stories about not being allowed to use Swamp Thing in comics he was working on. As Dave pointed out to me on the Twitter regarding the one incident that occurred during Byrne’s initial Action run in the ’80s, Byrne blames the Vertigo editors despite that imprint’s existence being several years away, so the Vertigo/DC editorial split wouldn’t have been the excuse to keep Byrne from using Swamp Thing in a Superman team-up. Interesting that, as it’s told, the Big Name Creator DC essentially put in charge of the entire Superman franchise at the time couldn’t use whatever character he wanted from the DC Universe, but the New Guy Writing the Weird Horror Book could use a Superman character (Lex Luthor) over the Big Name Creator’s protests. …Perhaps the first stirrings of the coming DC/Vertigo split, or just favored treatment of one creator over another as Byrne says…who knows. But it’s certainly an interesting story about that period of Swamp Thing’s history I hadn’t heard before. In other Swamp Thing news, there’s an interview with Swamp-writer Scott Snyder where he hypes Swamp Thing’s arrival (finally!) in the new Swamp Thing series. Also noted is the return of “a really classic villain” from Swamp Thing’s past, not named by Snyder, but really, aside from Arcane, how many other “classic villains” does Swamp Thing have? Jason Woodrue, the Floronic Man? General Sunderland? M’nagalah? God help us, Sabre? …Seriously, if this ends up being the return of Nathan Ellery, well, you know what’s gonna happen then? The answer is Cranius. The answer is ALWAYS Cranius. Don’t blame me, I didn’t ask for it…. One of Swamp Thing’s earliest foes = FIRE! OK… Fiery explosions with chemical compounds. See? Because when Alec Holland… oh, nevermind… the answer is always Cranius. Hey, MASH itself is a reboot, you know. There, mind blown. You’re welcome. Tim – CRANIUS! Of COURSE! http://en.wikipedia.org/wiki/Combat_Hospital What’s really cute is they set it in 2006 for fear that the war in Afghanistan might end. Could be Connie Sunderland.Not exactly “classic”,though.Crainius would be cool but I’m hoping for Arcane and his new baby. The thing is, Connie reformed during the Mark Millar run. Now that Swamp Thing will actually appear in the new ST book, maybe Mike Sterling will actually read it instead of just collecting it for the covers! Speaking of big green comic book monsters, just two more days until Incredible Hulk #1 (1962) turns 50…..
Actually,Connie went bad again in the Un-men.Well,she screwed over Crainius so maybe that doesn’t count.And if I follow it correctly,none of this is relevent anymore,right?It sure takes some getting used to when they drop all the history. Snyder says all of Swamp Thing history counts (including Un-Men). However, the DCnU is a brand-new universe (Earth-0, not Earth-1) so basicly nothing whatsover counts in ST until Snyder says so. So Snyder and Lemire can do no wrong (or right) with Swamp Thing and Animal Man. So far, I’m very, very underwhelmed by Swamp Thing volume 5. I have a theory (and please point out the 373 times in which I’m wrong), but I think we’re less likely to see reboots of franchises that are very closely tied to strong, identifiable actors. It would be difficult to get another workable Columbo, Magnum P.I., or Murder She Wrote. (Maybe it’s limited to mysteries…). TV MASH was certainly a reboot of the movie, but who could play Hawkeye after Alda? Cej: Does Kojak count? He got a failed reboot in 2005 on USA.